Oh risotto. You’re such a lovely dish and I don’t know why you suffer with such an unfair reputation of being difficult to make. It’s not your fault. I suppose at some point somebody in a fancy restaurant somewhere started the rumor so that people would be willing to pay unreasonable amounts of money for such a simple grain-based meal that’s easy to make at home. Seriously folks. If you’re under the impression that risotto is difficult to make, let me break it down for you. Butter is melted. Onion is sauteed. Rice is added. Wine is added. Broth is added. Protein and/or vegetables are added. Cheese is added. Dish is seasoned with salt and pepper. Now that doesn’t sound too bad, does it? I suppose I should mention that there’s also some stirring involving. OK, there’s a lot of stirring involved. But as far as kitchen tasks go, I’d like to think that stirring is definitely on the easy end of the spectrum. Molecular gastronomy it is not. 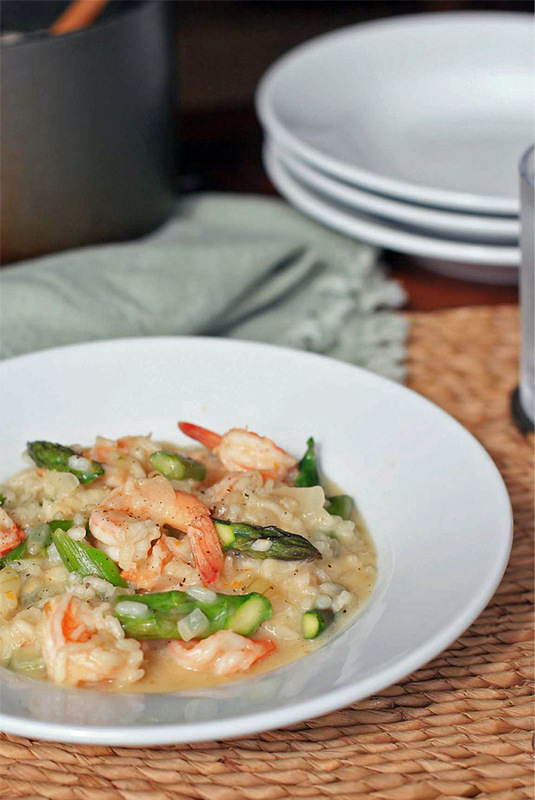 I often make asparagus and mushroom risotto for myself, but when I’m in the mood for just a little bit of extra protein, this shrimp and asparagus risotto is just the ticket. And thanks to that rumor floating around, if you serve this to company, everybody will think you’re a total rockstar for making it. In a medium saucepan heat the broth over medium-low heat. 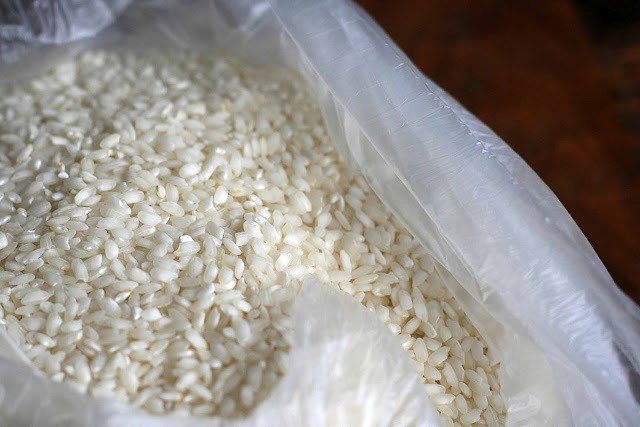 You want the broth to be nice and hot so that it doesn’t slow down the cooking process when you add it to the rice later on. In a large saucepan, heat the olive oil over medium-high heat. Add the asparagus and cook, stirring frequently, until tender-crisp. 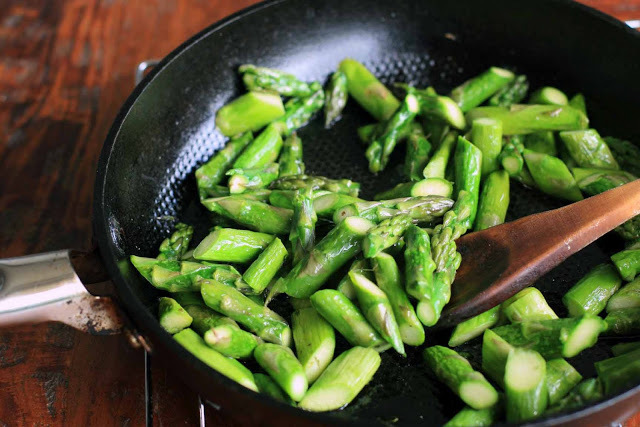 Remove from heat and remove the asparagus to a plate or bowl. In the same large saucepan, melt the butter over medium heat. Add the onion and cook, stirring, until softened and translucent. Add the rice and stir to coat. Cook for 2-3 minutes. Add the wine and cook, stirring constantly, until the liquid is almost entirely absorbed by the rice. Add 1/2 cup of the hot broth and continue to cook, stirring constantly, until the broth has been almost entirely absorbed. Repeat the process, adding broth in 1/2 cup increments. 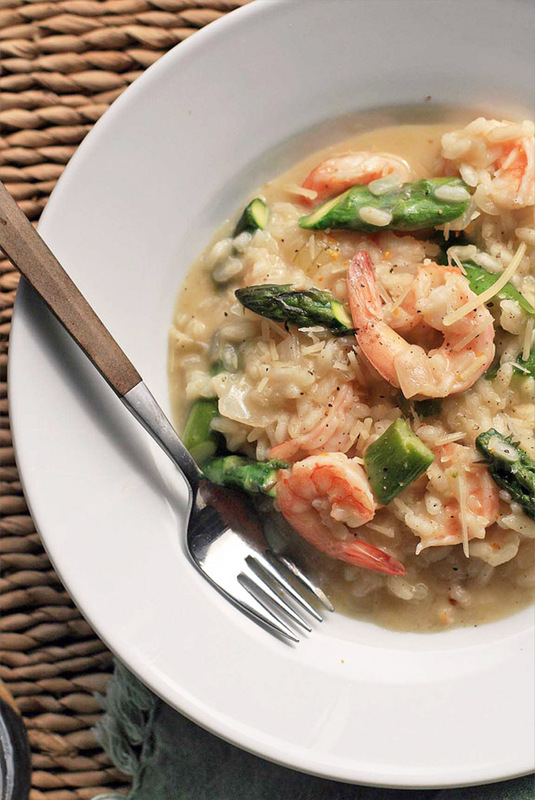 Start tasting the risotto after adding 3-1/2 cups of broth- the amount you need will vary depending on your rice. You want the rice nice and tender but with a little bite/firmness still left (note: you may end up with leftover broth. In the event that you’ve added all of the broth but your rice isn’t softened enough, you can just use hot water). 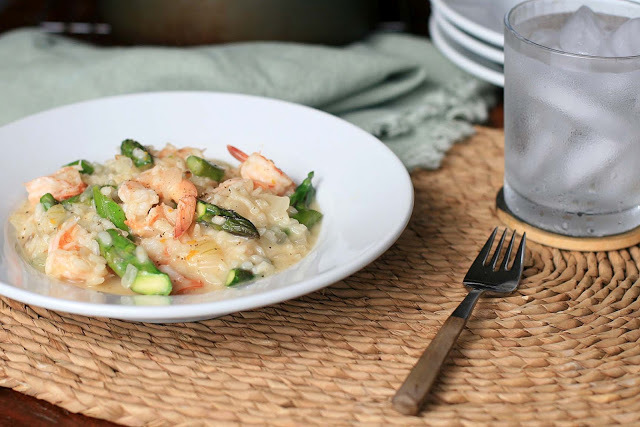 Add the shrimp and pre-cooked asparagus and continue to cook, stirring frequently, until the shrimp has turned pink and is cooked through. Add the lemon zest (optional) and Parmesan cheese and stir briefly to incorporate and melt the cheese. Season with salt and pepper to taste.